Director Amy R. Cohen helps Jordann Pruitt ’19 put on his mask for the Greek Play. UPDATE: Rain location for the Greek Play is inside the Houston Memorial Chapel. This weekend, Randolph students will continue a tradition that began at the College 107 years ago. 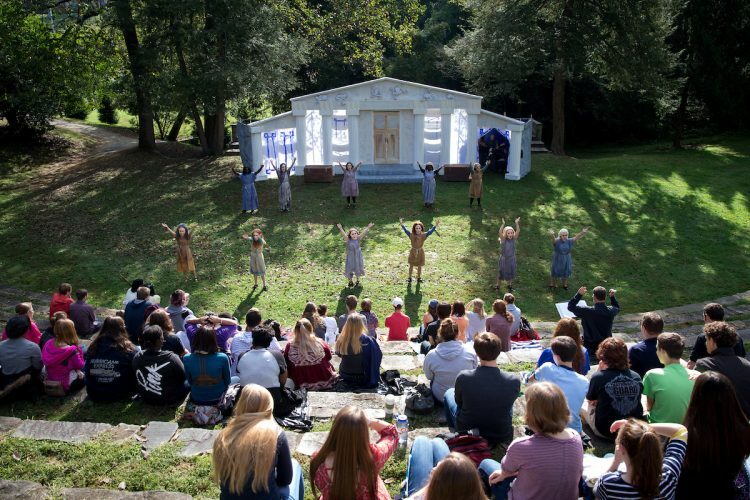 This year’s production of the Greek Play, Aristophanes’ The Frogs, is part of Randolph’s special 125th anniversary celebration and will include a performance on Saturday during a series of events for the occasion. In 1909, Mabel K. Whiteside, the College’s Greek professor, produced the first Greek Play, Euripides’ Alcestis. The performance was held entirely in Greek. She led an annual production of a Greek play from then until her retirement in 1954. Beginning in 2000, Amy R. Cohen, Professor of Classics and the Catherine Ehrman Thoresen `23 and William E. Thoresen Chair of Speech and Theatre, revived the tradition and began producing Greek plays using the original conventions of Greek theatre. In addition to using special masks modeled after those used in ancient drama, Randolph’s plays utilize other conventions such as having just a few actors play all the roles and a chorus that remains on the stage for most of the play. The Frogs features a new translation by Mike Lippman and Diane Arnson Svarlien, and follows the exploits of Dionysus, the god of drama, and his quest to save Athens from itself by bringing back its greatest playwright from the Underworld. Four actors—Jordann Pruitt ’19, Samuel Sun ’17, Daisy Howard ’17, and Michael Pulliam ’18 will serve in 12 different roles in the play. An orchestra, directed by music professor Randall Spear, will provide musical accompaniment, playing pieces arranged by physics professor Katrin Schenk. 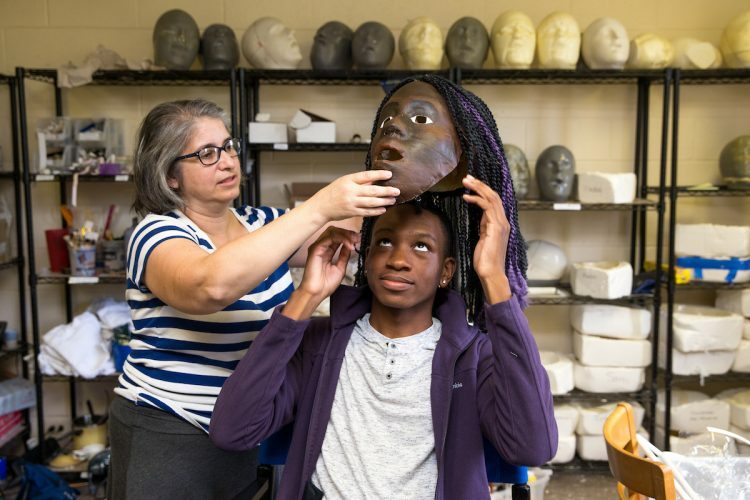 Cohen said many others from the campus community also played a role in costume and mask design, choreography, and other preparations for the show. That’s just one of the aspects that makes Randolph’s production so unique, Cohen said. The play also gets attention beyond the Randolph community. Classicists from around the world regularly attend the Greek Play, which coincides with the Ancient Drama in Performance conference held on Randolph’s campus. 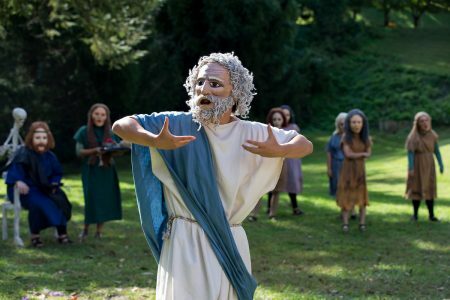 Cohen said the play’s slapstick-style humor is sure to draw laughs from the audience, and that the Greek Play tradition has played an important part in the College’s history. Performed in the Mabel K. Whiteside Greek Theatre, also known as The Dell, The Frogs opens Friday, October 7 at 4 p.m. Shows are also scheduled October 8 at 1 p.m. (as part of the College’s 125th anniversary celebration) and October 9 at 4 p.m. For more information, please visit www.randolphcollege.edu/greekplay. *** This play may not be appropriate for younger audiences.